"We elves try to stick to the four main food groups: candy, candy canes, candy corns and syrup." If it has sugar in it, Buddy the Elf is ready to eat it. Whether it’s a bottle of soda or a pile of spaghetti with candy and syrup, he’s not afraid of a sugar crash! If you were to look into Santa's workshop you would see something that just doesn't fit. You would see a lot of little elves hard at work and one giant elf also helping out. That larger than everyone elf is named Buddy and he is kind hearted and loves Christmas more than anything. Now you can look just like the syrup chugging elf in this fun holiday costume. 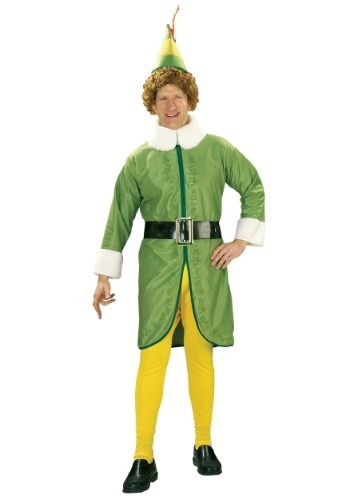 This officially licensed Elf costume come with everything you need to make a grand entrance at your holiday party this season. The nylon and polyester green tunic jacket fastens with Velcro at the back of the neck for easy on and off. The tunic is adorned with fur cuffs and a fur collar as well as printed leaves and vines on the front to match the costume from the hilarious movie. The 100% polyester gold tights have enclosed feet and an elastic waistband for a comfortable fit. Top it all off with the black faux leather belt that has a large gold-tone metal buckle and the essential foam elf hat with a sewn-on feather. Be sure to pick up a curly wig to complete your look for this holiday season!